Tim and I had planned in April to visit Arizona because he loves it out there and hasn’t been in over 8 years since he left Arizona State. After counting down, the day finally arrived. Once we boarded the plane to our destination, he pulled out a beautiful white camera (Tim added the link if you’re on the market for one). I had been eyeing them since I started blogging, and he thought we could “use it for the trip”. I was so shocked, I thought it was going to be the big surprise of the trip. Almost every girlfriend I talked to about our vacation was pretty certain that he was planning to propose. It wasn’t until the trip got closer that I started to wonder if/when it would happen. We have been talking about marriage for a long time, and I honestly knew he was the one after our first date (possible even before it! Hey, I know what I want). When a proposal didn’t happen the first night in Sedona (too predictable), or by the third morning after hiking up Camelback Mountain, I had pretty much let go of the idea. The trip was already going perfectly without it (minus Hertz screwing everything up – I’ll be a good little story teller and save you the deets). On the morning of the proposal (August 7th, 2015), we hiked Camelback Mountain. I wondered if he would propose at the top, because our song is “On Top of the World“. I didn’t think she’d want dirty/sweaty photos but it did cross my mind. I underestimated how difficult the hike would be, but the view at the top was well worth it! After we made it back down we went straight to breakfast, cleaned up, and went to Fashion Square Mall (which was pretty spectacular… I think Tim took me there to help talk me into moving out there – I didn’t think it would hurt my chances. The rain actually moved in that day, which is a rare occasion for Arizona. Tim stayed calm about the weather (on the outside – poker face) careful not to give off any red flags for why a clear sky was so important. Afterward, he told me he checked the weather app every 30 minutes (more like 30 seconds). The rain ended up clearing out, so I wanted to take blog photos before dinner with the new camera. He suggested doing so outside by the big cactus (which was my thought all along… I’m sure he was relieved about that!). This was going to be the only suspicious part of my plan (to get me to the spot he wanted). While we were shooting pictures, he denied 3 people who asked if he wanted them to take a picture of us. In my head, I was like umm… I want a picture together… but maybes he’s just really into taking my blog photos (always) with this new camera right now and we’ll get some together in a little bit). Which eventually happened…. He had snapped 450+ photos of the whole thing, and his sister was hiding around the corner taking video. I was so surprised they had made the trip from Vegas to share this moment with us. Leanna brought out beautiful pink roses, champagne for a toast, then we took more engagement photos (we were late to dinner, of course). Unfortunately, the band went on too late to play “On Top of the World” for us, which I had been coordinating for a month. The next morning we had a 90 – minute couples massage at the spa, followed by a private terrace with strawberries, cake, and champagne.. Seriously, what did I do to deserve this man?! (A Facebook friend request- ha, that’s another story). 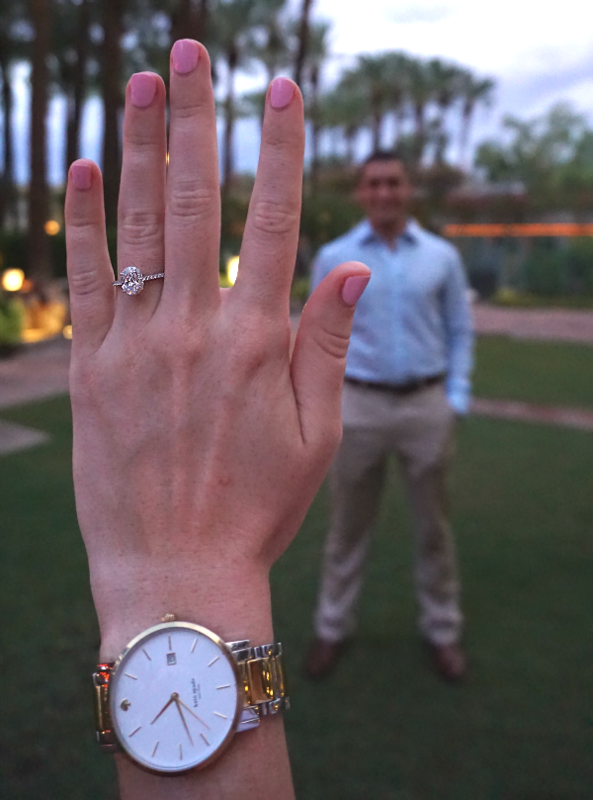 I’m not gonna lie, a few weeks back I had dreamed up a similar proposal in my head (blog photos to throw off capturing the moment, yet he still managed to surprise me). Tim just know’s me, better than I know myself sometimes. I wanted her to share my love for Arizona with me – and I definitely do! God created him just for me, and that’s my constant reminder for how deeply I am loved by my savior. And that’s where our next chapter begins. 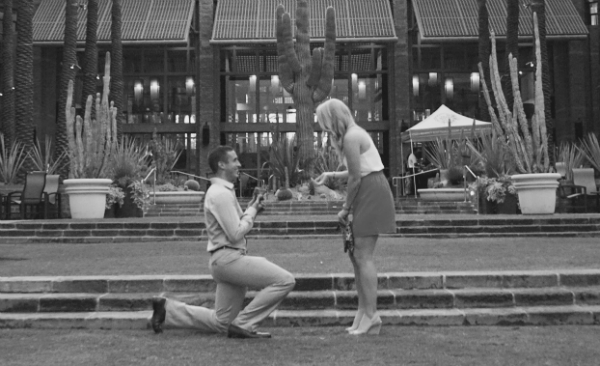 Such a cute way to share your proposal story! 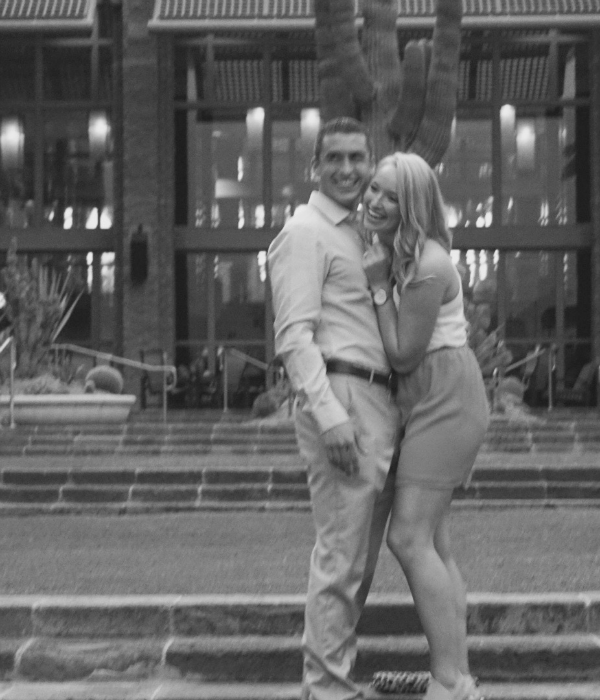 Arizona has the perfect weather and scenery for a great outdoor proposal. Way to go Tim on the ring–such a pretty shape. Congrats to you both! AHH THANK YOU! I need to be pinched again. Aww!! Is your ring oval? Mine is, and I'm obsessed! Congratulations and God's blessings! It is! I just stare at it most of the day to remind myself that this is real life! Love this!!!! So glad we could re-live this moment!!! 🙂 Great story!!! 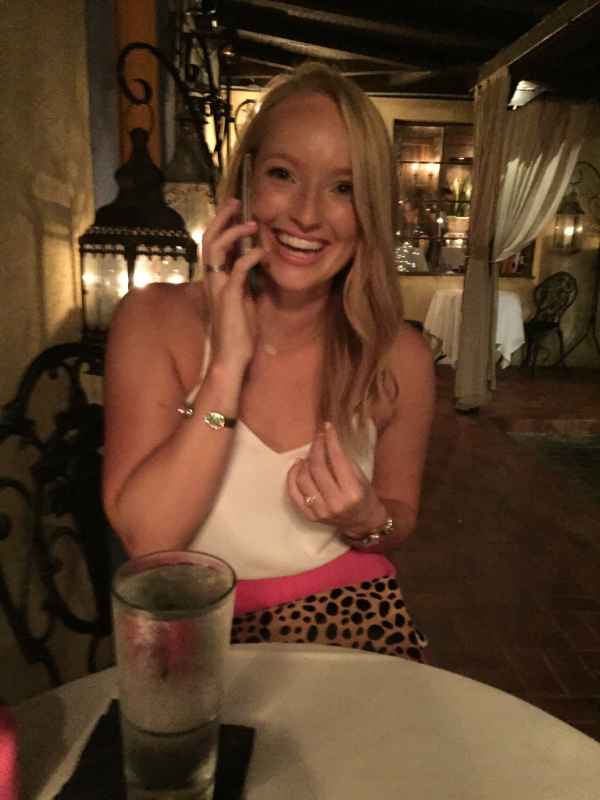 Congrats – your ring is stunning!!! Great story, and the pictures in the moment are fantastic. I just stumbled upon your blog as a fellow GA blogger and wanted to say congratulations! 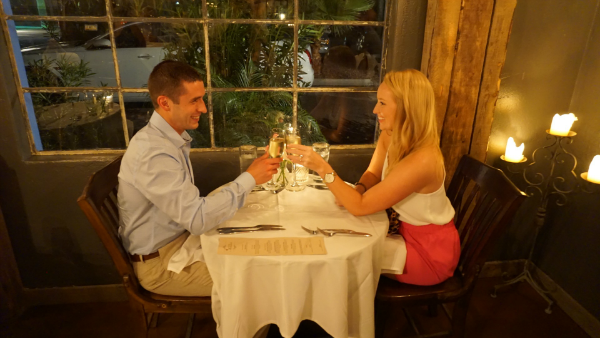 This is so sweet- I always love reading engagement stories. Enjoy every bit of wedding planning, it can be a little stressful at times but it is SO worth it!